A small repulsion-based hovercraft capable of high speeds over flat terrain. Okay, tell the truth: when you first watched Star Wars, did you carefully scrutinize the area underneath the landspeeder? It looked distorted, like heat waves on a hot pavement. For a moment Luke hesitated at leaving the machine behind -- but, he argued to himself, it's vital components were obviously shot. So he jumped into the landspeeder, causing the recently repaired repulsion floater to list alarmingly to one side until he was able to equalize weight distribution by sliding behind the controls. Maintaining its altitude slightly above the sandy ground, the light-duty transport vehicle steadied itself like a boat in a heavy sea. Luke gunned the engine, which whined in protest, and sand erupted behind the floater as he aimed the craft toward the distant town of Anchorhead. This device is one of the simple ways (although it wasn't so simple to film in those pre-CGI days) that Lucas establishes that you really are in a galaxy far, far away. If you are interested in the subject of hovercraft, be sure to see the entry for hovercraft from Mona Lisa Overdrive by William Gibson. He didn't invent hovercraft, but he did make them look cool. Finally, check out the original idea for this kind of craft - the flitter from 'Doc Smith's 1941 story Vortex Blaster. 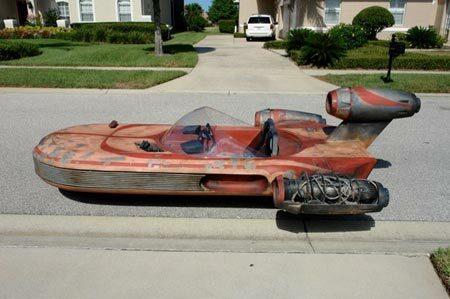 - Hover Bike Like Star Wars Landspeeder - With Video!